Musicians, your ears are trying to protect you from hearing loss. Let them do their job and keep you healthy by keeping both of your in-ear monitors in. This is a visual pun. The design is intentionally bad. As a musician that uses in-ear monitors (IEM), the tympanic reflex is a topic I regularly think about, but can never remember the name of it. I should file this article under “personal reminders.” I’m writing about it here so I can find it faster in the future. Our bodies have a natural protection mechanism built into our ears that tries to prevent hearing loss from loud noises. I’m not an audiologist, but from what I understand, the tympanic reflex is an involuntary reaction that temporarily muffles the transmission of louder sounds by contracting some inner ear muscles. 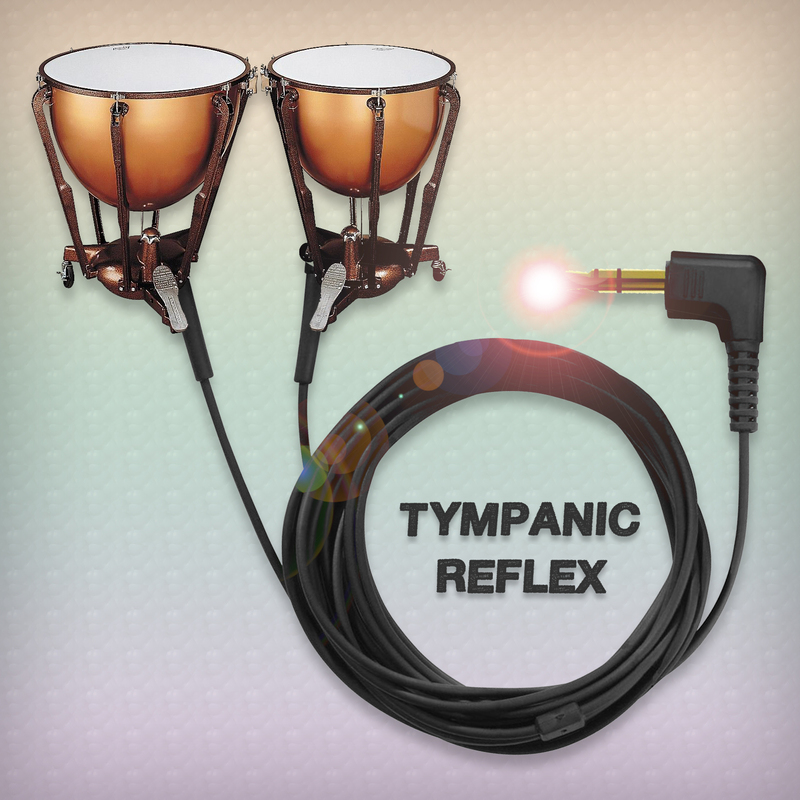 Unfortunately, the reflex is not immediate; it takes about 40 milliseconds to kick in, which is why very sudden loud noises like gunshots, explosions, snare drum hits, and shouts can still do a lot of damage. But the reflex does help (to some degree) to reduce damage from sustained loud noises. Why should musicians care about tympanic reflex? Many musicians now use IEMs instead of stage wedge speakers to monitor audio in live performances. IEMs can help solve a lot of problems that stages wedges present. IEMs can help reduce overall stage volume, prevent hearing damage, allow musicians to hear exactly what they need or want to hear better, and provide click tracks or guide tracks that the audience can’t hear. However, to provide these benefits, good IEMs completely seal off the “outside world”—an auditory experience which can be quite alienating for performers. This disconnecting feeling drives many musicians to play with only one “ear” in. Best of both worlds, right? Nope. The bad news is that the tympanic reflex doesn’t kick in when our ears hear a loud noise isolated in one ear. Our bodies didn’t evolve to adapt to such an unnatural experience, so we can’t benefit from the natural protective effects of the tympanic reflex in such a scenario. Musicians, please wear both IEMs. It’s all or nothing if we want to protect our hearing over time. I know a few of my fellow musicians that have hearing loss due to wearing only one earbud. Protect yourself before you wreck yourself. If you are looking for IEMs, there are tons of options now. I have some Shure E2 earbuds I got a while ago. They’re alright. I don’t love or hate them. I know there are better options out there now (prices correlating with quality). Shure has lots of newer options. Tons of consumer-grade options exist. For professionals, I hear a lot about IEMs from Westone and Future Sonics. I first read about the tympanic reflex in this article In-Ear Monitors: Tips of the Trade by Keith Gordon. I was researching best practices for IEMs and discovered some valuable tips there. Check it out. Just wanted to point out how huge the Sun is. That’s all. Me playing slide guitar in front of a bonfire. Photography by Ben Gilliom. Indiana is hot today – really hot – maybe a record setter. News outlets are saying that in Colorado wild fires are crawling across mountains and consuming neighborhoods. The heat and fires have me thinking about something I often think about: how big and hot the Sun has to be for it to be this hot and bright here on Earth. Being a country boy, I’ve attended a fair number of bonfires. Some of them have featured quite enormous, roaring fires. Yet, no matter how big the fires have been, the heat and light quickly drop off just yards away and the night remains dark, cold, and unaffected. I haven’t measured this myself, but I’m told that on average the Earth orbits somewhere around 92,960,000 miles from the Sun. That’s a long way away (approximately 1 astronomical unit). The Sun is so far away that it takes about 8 minutes for the Sun’s light (which coincidentally travels at the speed of light 299,792,458 miles/second) to reach us here on Earth. So compared to the bonfires I’ve seen, I think about how big that burning ball of fire we call the Sun must be for it to be this hot and light out here. Amazing. Even more amazing: compared to other stars in the Universe, the Sun isn’t even a very big star. Here’s a fresh tasting salad that’s as incredibly delicious as it is verifiably healthy. After taking this picture, I ate the entire bowl by myself. After returning from the supermarket with a load of super foods late one night (which is the perfect time to go grocery shopping), my appetite was… “heightened.” So, I decided to make a little snack using the ingredients I had just purchased. I quickly chopped up some stuff and threw it in a bowl. Honestly, I wasn’t expecting much because I didn’t give this concoction much thought, but I knew I had discovered something after that first bite. This recipe kind of feels like a home run – or maybe even a grand slam. It’s easy, fast, delicious, and healthy. You can’t ask for much more than that. In a large bowl, zest and juice the lemon over the garlic and oregano to kick start the marinating process. Pour the liquid from the artichokes in the bowl. Quarter the tomatoes and artichokes into similar size pieces and chop the parsley. Dress with some good olive oil and a little salt & pepper. Stir to combine. Allow the magic to marinate for as long as you can stand. Usually I can only wait about 10 minutes, but if you have patience you can prepare this recipe day ahead of time. Serves 4-5 adults (or 1, if you’re me). Download this recipe in PDF Format! What is the proper way to use these common every day measurement terms? There doesn’t seem to be definitive consensus on the matter of the proper way to use the terms height (H), width (W), depth (D), and length (L) when describing the dimensions of things. Usually we are left to sort out which dimension each term is describing on a per object basis. This is stupid. I need cases for my studio monitors. Touring is not very friendly to delicate reference speakers, so proper cases are kind of important. Since the manufacturer of these particular monitors does not make cases, I had to look to other manufacturers for appropriately sized cases. In the specifications for the monitors the manufacturer lists their product in H x W X D dimensions. That’s fine, but one case manufacturer lists their product in H x L x W. Another manufacturer lists their cases in H x L x D. That makes immediate identification of a properly sized case a bit difficult. The fact that some manufacturers list their products in imperial measures while others use the metric system complicates things too, but I’ll save that for another day. Isn’t it funny that we don’t have standardized language for something as common as measuring the size of things? To be clear, this isn’t necessarily a science problem, but a linguistic problem. Science has created a variety of coordinate systems to make sure we send rockets in the right direction, but for every day use we don’t have a standard system of common words. I love the English language, but it is rife with deficiencies. Don’t get me started on the lack of a “grammatically correct” gender-neutral third person singular pronoun. Grammarians, if you’re reading this, stop complaining about the misuse of “they” and SOLVE THE PROBLEM. In most cases, an object’s dimensions can be described using Cartesian, cylindrical, or spherical coordinate systems with words we already know and love. If an object is roughly box–shaped, orient the object so you’re looking directly at it’s forward-facing orientation and describe it as if you’re looking at it from the “front.” This means you’ll have to determine which side is the front. Most things have one. If your object doesn’t, then it’s probably not useful and should be recycled. (Kidding.) For example, studio monitors are useful because their front side houses speakers which emit sound. Using Height, Width, and Depth (in that order), make your measurements. Roughly 3 out of 4 objects in this world can be described this way. If an object is long but round instead of boxy (e.g. guitar cable, baseball bat, spaghetti), use Diameter (D), Radius (R), or Circumference (C) (usually in that order of preference) and Length. If it’s something like a drinking glass or flag pole, use H x D/R/C. If an object doesn’t have any boxy sides and is mostly round like a ball, use the Ball Method. Describe your object by choosing a ball that’s roughly the same size. Hail and cancer are the most common things to be measured this way, but it’s used for all sorts of things. They are good because they are self-explanatory. Here are some of the most common sizes. Pick one. Now for the sake of progress, can we all agree on this and get back to doing whatever it was we were doing before we had to sort this out? Good. Glad we worked through it. @BEHRINGER future: Cerebral vs. Digital. Was it made entirely “in the box (aka your head)” or did you collab with other humans and devices? Realizing there’s much more to this debate than just a tweet, I thought I’d talk more about it here. In my original tweet, I used the phrase “Cerebral vs. Digital” to describe the future debate I imagine will happen. Maybe my choice of opposites wasn’t perfect. Better words can probably be found. This concept of diametrics I have in mind could be expressed in a variety of ways. Each of those word combinations is describing the same contrast of ideas. But how to best describe it? 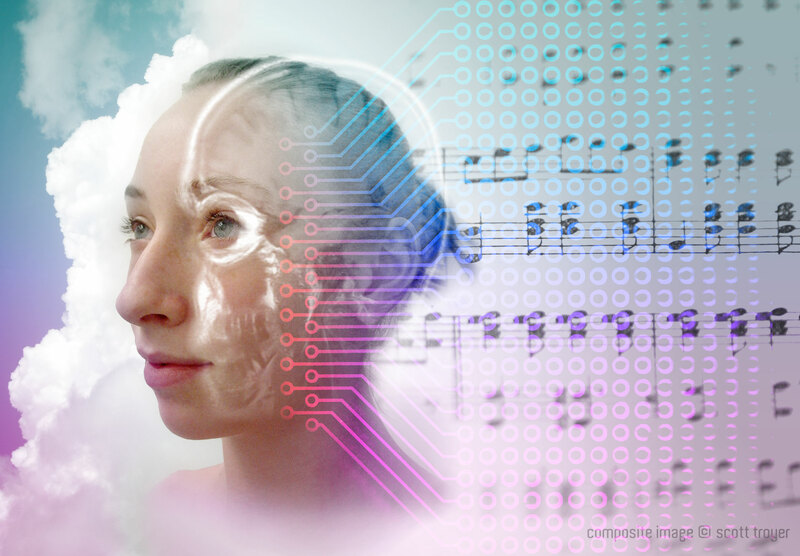 In the (maybe not so distant) future, musicians will have the ability to directly output music from their heads. Technology will be developed that will allow artists to simply think/imagine/hear the music in his/her head and output this as audio and/or notation. This cerebrally generated “audio feed” could be routed (maybe even wirelessly) to a recording device to be documented, distributed, and sold. Theoretically, this process could happen as a live performance. The signal could be routed to a sound system for a concert, to an internet connection for worldwide streaming, or even directly injected (almost telepathically) into the head of a “listener” outfitted with the proper “receiver” device. The possibilities are fantastic. Composers could direct an entire imaginary orchestra as they hear it in their minds. Dancers could dance to their own music in real time. Musicians could play exactly what they intend to play. Singers could sing in whatever voices they can imagine. Handicapped artists suddenly would be unrestricted by their handicaps. This is not a matter of if, it’s a matter of when. If we already can control toy helicopters with our thoughts, then it’s only a matter of time before we can output music directly from our minds. UPDATE (2011-09-23): This just in… UC Berkeley neuroscientist Professor Jack Gallant announced today that it’s possible to recreate the video from brain activity. This technological breakthrough in music will follow a path familiar to video games. With the Wii, Nintendo brought wireless motion-sensing accelerometer action to everyday people. The developers of Guitar Hero and Rock Band banked a lot of cash by making it really easy to “play” popular music without having to learn an instrument. Microsoft’s Kinect for Xbox removed the need for a controller, allowing the person to become the controller. I don’t know who will create the first mind-controlled music technology, but somebody’s going to do it. Cool meant something totally different back then. Don’t judge. As with any change, it’s going to get worse before it gets better. Unfortunately, music will experience yet another Regrettable Period in which we have to learn how to use this new technology properly. I predict some gross and unsavory abuse of the technology, much like the ubiquity of terrible synthesizers in the 1980s or prevalence of auto-tuned vocals since Cher started believing in life after love. But some lucky artist is going to enjoy the honor of being known as the one that mastered this wonderful new system, thus becoming the “Grand Master Flash of whatever-this-thing-may-become-known-as.” Someone will figure out how to use it right, but it might take some time. In the meantime, wear earplugs. At first, this newfangled gadgetry will be heralded as the end of “real” music and musicianship. The critics will say it’s too easy and not authentic music. Traditional composers and invested players will complain that no one has to learn how to write or play anymore. And much in the same way that digital was derided as a poor substitute for analog, purists will say that this cerebral form loses something in the process. Those arguments all might be right, but there may be a bigger issue lurking. When the process of making music becomes entirely internalized it will be really great because of it’s purity and singularity of thought, but will it simultaneously suffer from lack of external influences? When digital recording became popular, the question was often asked by one artist or engineer to another: “Was this all done ‘in the box?’” – meaning: was the audio signal created, mixed, and mastered on the same computer? Early on, music created entirely in this fashion lacked the beneficial effects that analog systems inherently imparted upon the audio signal. Today, the line has been blurred by better technology, so it’s harder to tell if something was recorded analog or digital. Only engineers with “golden ears” can hear the difference (even then I suspect shenanigans). At any rate, the question still remains: What benefits will be lost due to the signal remaining “in the box” of your head? People – The comradery, inspiration, ideas, criticism, differing views, and friction found when people work together often makes for better music. Being alone can lead to dead ends and boring or bad music. Collaboration can make beautiful things. Hardware – Though they are inanimate objects, the instruments and devices used to make music come with their own inspirations, challenges, rewards, frustrations to overcome, and occasional good glitches. Sometimes a piece of gear has to be conquered and relinquishes its magic upon defeat. Criticism – The critic is the archenemy of the artist, but every good story needs a villain. Without judgement, no work is ever as best as it can be. Words are often revealed for their folly only after they’ve left the head. Movement – Music and movement are very strongly related. When making music, movement is both part of the instigation of sound, but also a reaction to the sound being created. Performance and dance are like cousins. So if movement is not necessary for the creation of music, what effect will that have on the final product? A lot of things can go wrong in this new system, but a lot of things can go right too. Eventually we’ll work out the kinks. We’ll figure out the typical pitfalls. We’ll master this medium like we have with all the others. One day amazing music will be generated using nothing but musicians’ brains. I’m hedging a bet it will be the direct output of some ridiculously young Mozart’s mind that will blow us all away. Perhaps this new interface will teach us something about how our brains work. Maybe it will allow us to communicate more precisely on ever deeper levels. What if it develops into a new universal language? Hmm. This is cool. My inner nerd had to come out and dance for bit. This is video by Kyle Jones, a designer, animator and illustrator from Nashville. Check out his website here and follow him on Twitter. He decided to record himself playing guitar using his iPhone from inside the guitar. Genius. Rejoice with me, all you audio and science loving geeks. If you want to know why this strange wiggly string phenomenon happened, ask my cousin Chris Whonsetler, the photographer behind the beautiful images found on WhonPhoto.com. Here’s his blog entry about rolling shutters.